Giving your kitchen a much-needed upgrade doesn’t require ripping out cabinets or installing expensive flooring. Instead of dropping a lot of money on those things, there are several inexpensive updates you can do on your own. One of the easiest upgrades to do in the kitchen is to give your countertops a new coat of paint. This simple upgrade can add a modern, contemporary look to your kitchen. Plus, it’s a fix you can usually complete over the weekend. Here are a few of our favorite tips to paint your countertops and have them looking brand new. Before you begin to paint, the countertops and surrounding areas need to be prepped. Remove any appliances and decorations on top of your counter. Be sure to protect the sink by placing a sheet of plastic inside of it. This will line the sink and prevent any paint from damaging it. You’ll need to tape the plastic to the sink so both the interior and edges don’t get any unwanted specs of paint. Painter’s tape will work best for this job since it’s easy to apply and remove. While it’s tempting to pick up the brush and start painting, this isn’t the best way to go. Painting the surface before preparing it will make it more difficult for the paint to adhere. Even worse, the paint may also begin to streak and look uneven. Cleaning the top of the Formica with a degreasing agent will help to remove any buildup and grime which may have accumulated. Once the counter is dry you can come in with a fine, 150-grit sandpaper to even out the surface. Be sure to vacuum up any debris left over from sanding. You’ll need to find a heavy-duty paint that will stand up to the daily abuse of cooking and cleaning. Epoxy, water-based paint or acrylic paint for interior use are ideal choices. In addition to the paint, you’ll also need to pick a good primer. 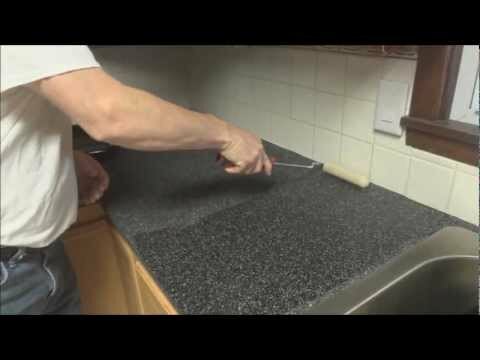 This will help make sure your paint goes on the counter with a nice even coat. After you’ve primed and painted the counters, you’ll need to give it a little time to set. Depending on the type of paint you’ve chosen it could take up to a few days to fully cure. It’s best to not use the counters at all until this happens. Skipping this step could cause all of your hard work to be for naught. When cooking, be sure to use a heat-resistant material such as a mat or wooden block on your countertops. Placing hot pots or pans directly on the surface can severely damage the paint. You’ll also want to avoid using any sort of abrasive as well. Steel wool and heavy-duty cleaners can strip and scratch the counters leading to you having to repaint the countertop. Painting your Formica countertops can give your kitchen a breath of fresh air. You can easily do it without taking a big chunk out of your wallet. By using these tips, you can help ensure the counters remain pristine and in good condition for years to come.